Heirlooms Reunited: 37 1890s-1940s Photographs of Related People, many from Kansas and Illinois: Lindahl, Jaderborg, Hays, Gundy, Nothstein, Paulson, etc. 37 1890s-1940s Photographs of Related People, many from Kansas and Illinois: Lindahl, Jaderborg, Hays, Gundy, Nothstein, Paulson, etc. 37 photographs, from about the 1890s to the mid 20th century, of people from Illinois, Kansas, Arkansas, and other Midwest and Western states, including several of the Lindahl and Jadersborg families of Lindsborg, Kansas. Most of the surnames are Scandinavian and German in origin. Interestingly, a Lindsborg, Kansas, website indicates that Lindsborg is "Little Sweden, USA". The woman in the photograph above is Antonia Christina Teichgraeber (1887-1964), daughter of Ernest Theodore Teichgraeber and Emma (Hartwig) Teichgraeber. The surname is also seen as Teichgraber. The "Helen L." mentioned in the identification was Helen Theodora (Teichgraeber) Lindahl, wife of Samuel August Lindahl and daughter of Antonia's uncle Emil John Teichgraeber and wife Ida Sophia (Johnson) Teichgraeber. Another photograph shows two young women: Edna Soderstrom of Hoisington, Kansas, and Lydia Jaderborg, presumably of Lindsborg, Kansas. Interestingly, Lydia J. (Jaderborg) Blomgren, wife of Dr. Carl Blomgren, is buried in St. Mary's Cemetery at Stonington, Maine, which fact might account for how the photographs ended up at an antique mall in the same Maine county, where I purchased them in 2005. Still another photograph, taken in 1913 by the Martin studio of Chicago, Illinois, shows Rev. 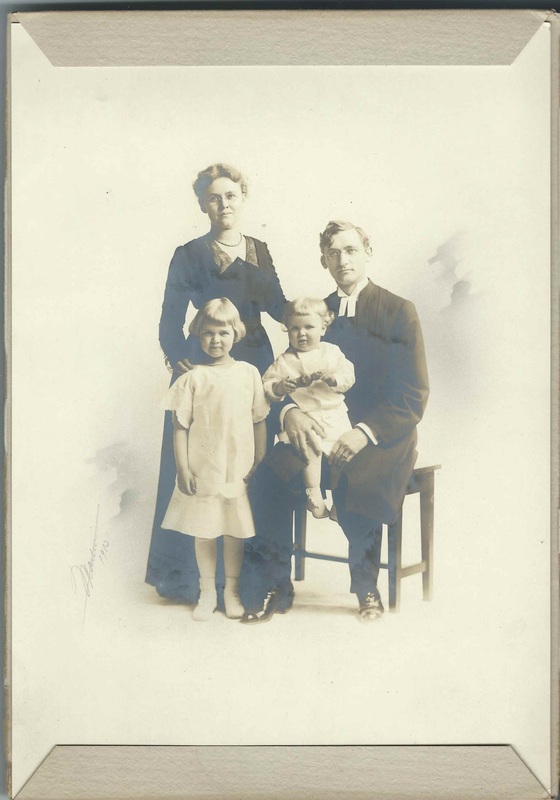 Otto Karlstrom and his wife and children. If you recognize any of the names in the photographs, or if you have corrections to my spelling, please leave a comment - being careful to respect the privacy of living people - or contact me directly. Hugo Emrick Lindahl, high school graduation photograph taken by the Grondal studio at Lindsborg, Kansas. He was born November 25, 1912, son of Emil and Julia Lindahl of Lindsborg, Kansas. Brother of Theodore E. Lindahl, whose photograph is also part of the collection. 3 photographs of Pat Hays of Little Rock, Arkansas; as a baby, as a toddler and as a toddler with sister Cindy. Elaine Gundy at 13 months and in a photograph with her brothers Richard and Jimmie; daughter of Floyd W. Gundy and Elizabeth (Nothstein) Gundy of Chicago, Illinois. 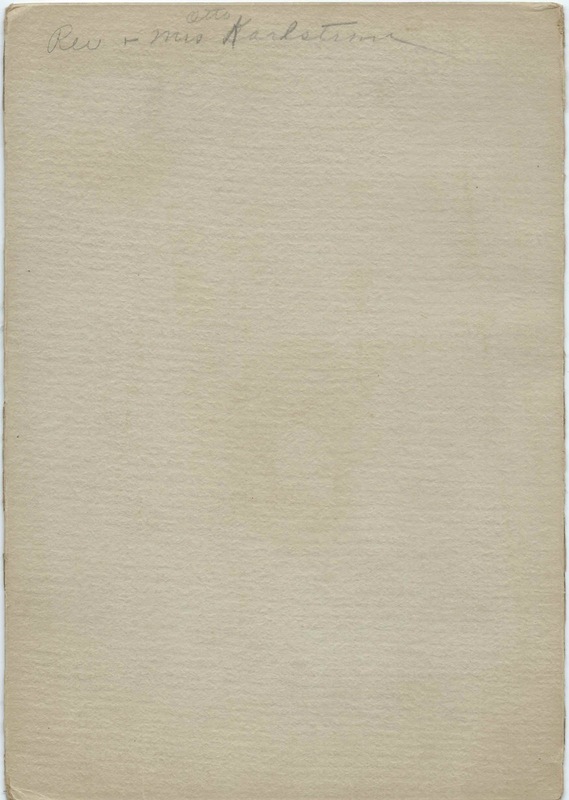 Elizabeth's photograph also appears in this collection. Baby of Floyd W. Gundy and Elizabeth (Nothstein) Gundy of Chicago, Illinois; the caption on the jacket reads "Gundy boys", but only one child is shown. Elizabeth's photograph also appears in this collection. Jimmie Gundy, in two photographs with brother Richard and sister Elaine; son of Floyd W. Gundy and Elizabeth (Nothstein) Gundy of Chicago, Illinois. Elizabeth's photograph also appears in this collection. Richard Gundy, in photograph with brother Jimmie and sister Elaine; son of Floyd W. Gundy and Elizabeth (Nothstein) Gundy of Chicago, Illinois. Elizabeth's photograph also appears in this collection. Betty Nothstein, "Ebis"; the photograph was taken at the Eckman studio at Rock Island, Illinois. 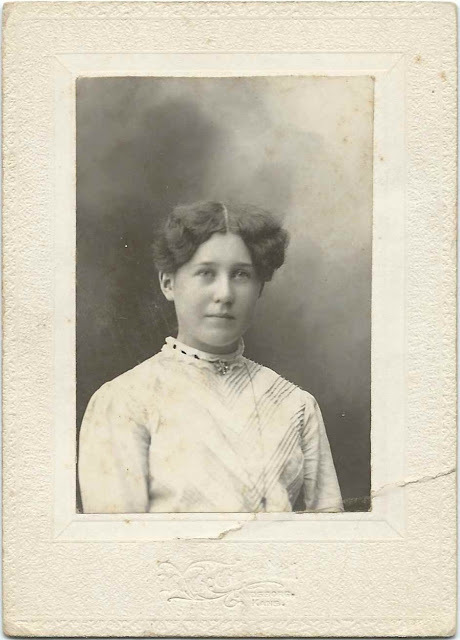 Elizabeth Nothstein was born about 1910, daughter of Ira Oliver Nothstein and Minnie (Kuhns) Nothstein. Betty married Floyd W. Gundy and had at least three children: Richard, James and Elaine, whose photographs also appear in this collection. Ruth Nothstein; the photograph was taken by the studio of John Eckman of Rock Island, Ilinois. Ruth was born June 24, 1911, daughter of Ira Oliver Nothstein and Minnie (Kuhns) Nothstein, and died in 1987. Esther Nothstein; by the Eckman studio of Rock Island, Illinois. Esther Louisa Nothstein was born June 11, 1902 at Nicollet, Minnesota, the daughter of Ira Oliver Nothstein and Minnie (Kuhns) Nothstein. 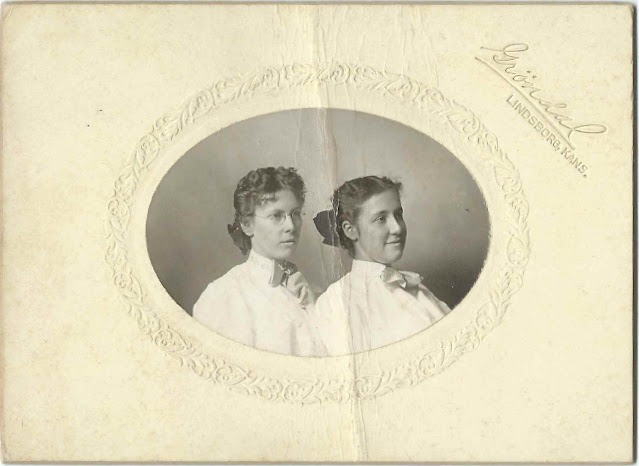 Lydia Jaderborg; in a photograph with Edna Soderstrom of Hoisington, Kansas. 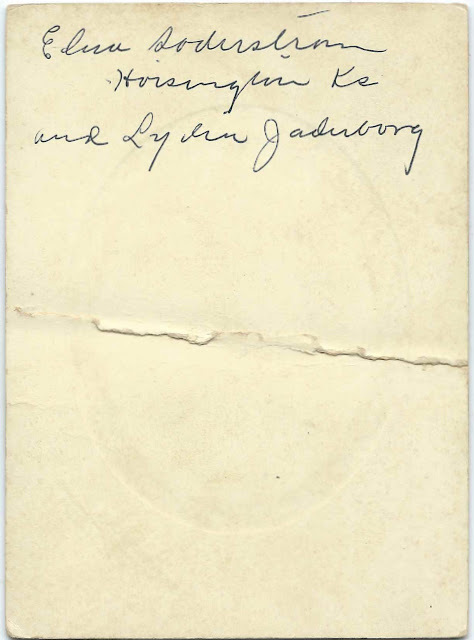 Lydia Jaderborg was born in Kansas about 1884, daughter of Lars Olof Jaderborg and wife Matilda. Lydia married Mr. Blomgren and is buried at Stonington, Maine, which might be how the photographs ended up at an antique shop in the same county. Ruth Tunander, also identified as Ruth Stevens of Seattle, Washington. The photograph was taken at the Bjorklund studio of Seattle, Washington. She was Ruth Viola (Tunander) Stevens, born in Michigan about 1898, daughter of C. A. Tunander and Anna S. (Johnson) Tunander; Ruth married Mervill George Stevens in British Columbia in 1930. Rev. and Mrs. Otto Karlstrom [not sure of surname] with two young children. 1913 photograph by the Martin studio of 5616 Chicago Avenue, Chicago, Illinois. Dr. H. E. Lundstedt, Pastor, Chicago. Not positive of surname. The photograph was taken at the Grondal studio of Lindsborg, Kansas. Svanhild Blomgren; photo by the Smith studio of Rock Island, Illinois. She was born about 1896 in Pennsylvania, daughter of Karl and Sigrid Blomgren. Svanhild married Walter D. Erickson at Rock Island, Illinois, on October 1, 1919. Blanche Lauger, with the faint identification. By the Lundquist studio of Lindsborg, Kansas. She was presumably Bertha Blanche Lauger, born March 28, 1891, daughter of John P. Lauger and Emma J. (Olson) Lauger. Viola Paulson of Kirkland, Illinois; the photograph was taken by the Eckman studio of Rock Island, Illinois. Presumably Nellie Viola Paulson, born March 21, 1909 at Kirkland, Illinois, daughter of Paul Edwin Paulsen and Nellie Christine (Peterson) Paulson. Viola married Wayne Townsend Remala. Evelyn Paulson - "Stayed at our home with her sister while going to college" - c1927 photograph by the Eckman studio of Rock Island, Illinois. Evelyn Leona Paulson was born March 29, 1906 in Illinois, daughter of Paul Edwin Paulsen and Nellie Christine (Peterson) Paulson. Evelyn married Mr. Hanson. 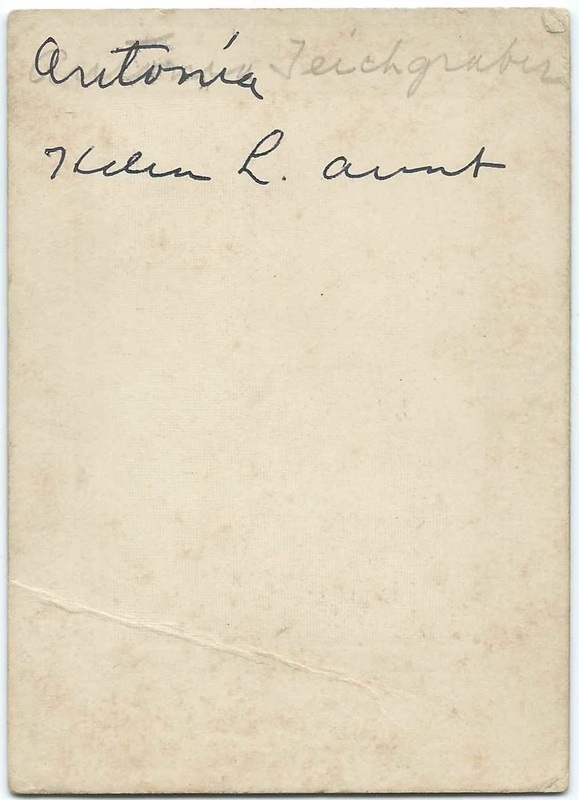 Antonia Teichgraber , "Helen L. aunt". Antonia Teichgraeber's brother Emil John Teichgraeber and wife Ida Sophia (Johnson) Teichgraeber were the parents of Helen Theodora (Teichgraeber) Lindahl, wife of Samuel August Lindahl. Antonia Christina Teichgraeber (1887-1964) married Joseph Emanuel Hagstrom. Ester Glatt. The photograph was taken by the Wierman studio of Abilene, Kansas. Presumably Esther Glatt, born August 15, 1922, daughter of Emil George Glatt and Marie Anna (Schlegel) Glatt. Esther married Melvin Engeman. Einar Henning Jaderborg at age 2 yrs, 2 mos. Born December 14, 1918, son of Thure Olof Jaderborg and Helen Justine (Lindstrom) Jaderborg. Became a physician. The photograph was taken at the Lindquist and Lindstrom studio at Lindsborg, Kansas. The photograph of his brother Thure Olof Jaderborg, Jr., is also part of this collection of photographs. Thure Olof Jaderborg, Jr.; graduation photograph by the Grondal studio of Lindsborg, Kansas. He was born in 1913, son of Thure Olof Jaderborg and Helen Justine (Lindstrom) Jaderborg. Brother of Einar Henning Jaderborg, whose photograph at age 2 is part of the collection. Young child; photograph by the Vin Farmer studio at Sault, Ontario; name and address on reverse: "Mrs. Fullam, 120 Warren or Wasson St., Bu"
Isla Romig of Topeka, Kansas. The photograph was taken by the Francis & Hodge studio of Topeka, Kansas. Isla Margaret Romig was born October 4, 1891 in Kansas, daughter of Ira Grant Romig and Lulu Minjetta (Middlekauff) Romig. Isla married Lionel F. Whitney. She died in 1948. Carrie Rufner. The photograph was taken by the Grondal studio of Lindsborg, Kansas. Adelia Constance Larson; her graduation photograph taken by the Grondal studio of Lindsborg, Kansas. Adelia Constance Larson was born March 15, 1897 in Kansas, daughter of Constant W. Larson and Emily Christina (Johnson) Larson. Adelia married Charles Grant Fury. Ed Calene. The photograph was taken at the Hansford studio at Kansas City, Kansas. Presumably Edward Louis Calene, born November 22, 1881 at Enterprise, Kansas, son of Erick Calene and Bertha (Molander) Calene. This is a picture of my great aunt Toni, Antonia Teichgraeber. Her sister Leona was my grandmother. She did not have a brother named Emil; Theodore and Emma only had two daughters, but Theodore had a brother named Emil. Quite a surprise... especially how much I look like her. Thanks for that clarification! Glad that you happened by to see your great aunt! As I recall, these photos came from an antique shop near Acadia National Park, perhaps from someone who retired to the area. Antonia Teichgraeber was my grandmother! My mother, Leona Hagstrom, was the oldest daughter. My mother married Carl Chappell and I am Carol Ann Chappell b 1945 in Jefferson City, MO. I am now living in VA Beach married with numerous grandchildren, Carol Jordan. small world. I would love to talk with you about how the name of Leona has been carried down in our family. Sorry to be late in seeing your comment, Carol. Glad that you happened upon this post! In my family, from the 1700s to 1900s, the name Isabella was passed down from the original immigrant Isabella from Scotland to Philadelphia to Nova Scotia (or perhaps she had also received the name from a predecessor). It's nice - though frequently confusing!